I created a polka dot background with a Sizzix embossing folder. Circle dies are from Spellbinders and white cardstock (used for background and scalloped edged circle) is recycled from a "gift-wrapped" shirt. All edges are distressed with smoky gray VersaFine ink. 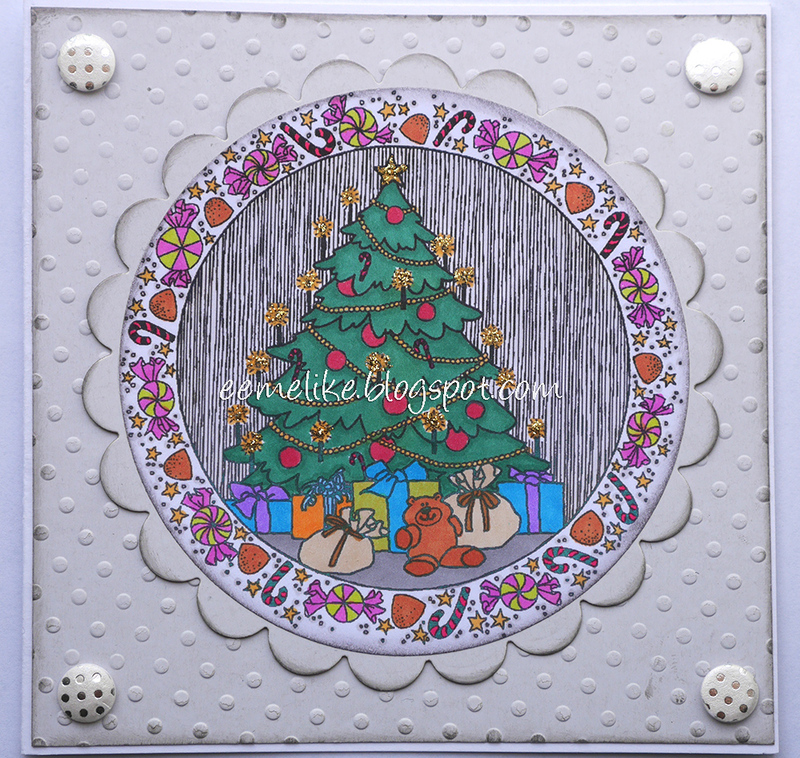 Image is from our sponsor Eureka Stamps, called Christmas Tree Circle, and I colored it with ProMarkers. On candles and star I added gold Stickles for some bling effect. Card candies (white ones with silver polka dots) for finishing touch. Pilkkutausta on kohokuvioitu Sizzixin kohokuviointitaskulla. Ympyrästanssit ovat Spellbindersin ja valkoinen kartonki (tausta ja piparireunainen ympyrä) on kierrätetty "lahjapakatusta" kauluspaidasta. Kaikki reunat on sävytetty smoky gray -sävyisellä VersaFinen musteella. Kuva on sponsoriltamme Eureka Stampsilta, nimeltään Christmas Tree Circle, ja väritin sen promarkereilla. Kynttilöihin ja latvatähteen lisäsin Sticklesin gold kimalleliimaa. Card candyt (valkoisia kera hopeisten pilkkujen) loppusilaukseksi. Fabulous Eeemeli! Gosh you did some teeny and tricky colouring there too - lovely card. 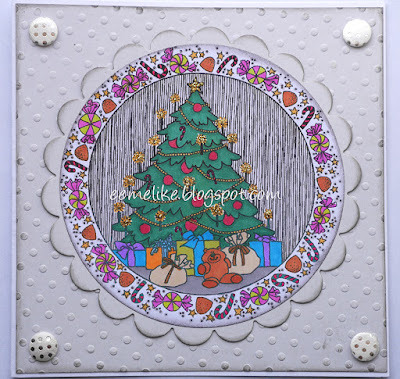 Brilliant card and love the tree and the lovely bright circle. Fabulous card! Love the vibrant colours on the image...and the embossing looks great! PS - thanks for also playing at the ABC Christmas Challenge! A beautiful card for Rudolf Day! Lovely colouring! A super card, with your embossed background. Thanks for joining in the fun at Sparkles Christmas Caz DT. A wonderful card! You did a great job with the DP. Your EF looks good and the design around the stamped image has the look of DP! Thanks for taking part in the August Rudolph Days Challenge. Sorry I am so late getting round to visit, but we have been kept very busy cleaning up after the storm. Finally finished raking the front garden today. It was full of leaves and small branches!.